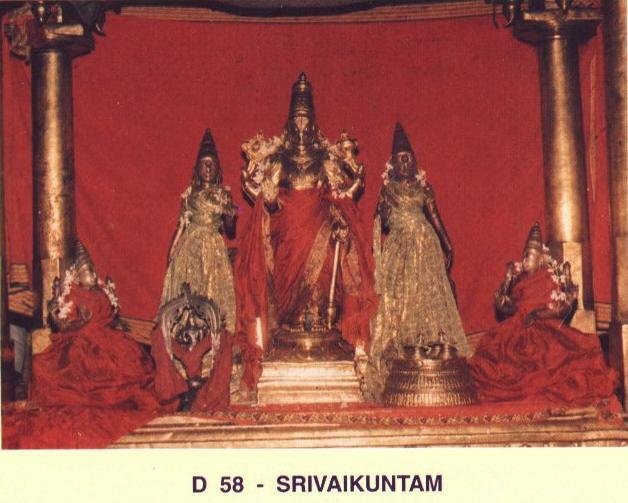 Srivaikuntanathan Permual Temple or Srivaikuntam temple is one of the Nava Tirupathi., nine Hindu temples dedicated to Lord Vishnu located in Tiruchendur-Tirunelveli route,Tamilnadu,Indiain the banks of Thamiraparani river. All these 9 temples are classified as Divya Desams, the 108 temples of Vishnu reverred by the 12 poet saints, or Alwars. At times of yore when chaos erupted in the satyaloga of the four faced Brahma he was relieved of the four Vedas which were bestowed to him by Lord Narayana as tools for creating life and humanity. To retrieve his invaluable treasures Brahma undertook penance at a holy spot situate at the banks of the river porunai (Thambra parani), pleased by his concentration and stubbornness Lord Narayana came to his rescue and retrieved the four Vedas from the asura Gomuka and restored them to Brahma. At the request of Brahma Lord Narayana agreed to permanently grace his presence in Archaform (as a statue) at the site of Brahma’s penance and bless the humanity. Brahma concecrated Lord Vaikunta Natha and performed the first holy shower for the Lord’s statue. Also Brahma inaugurated the first Chitra Utsav for the Lord. A local thief of the village srivaikunta invoked the blessings of Lord srivaikuntaNatha when he started for his daily nocturnal rounds (to commit night theft). For the purpose of evading arrest he faithfully offered fifty percent of his booty to the Lord’s temple. Along with his confederates he committed theft in the royal palace also. One day when one of his abettors got apprehended enquiry officers zeroed in for the thief. Lord vaikunta natha in the guise of the thief appeared before the king for enquiry and to face the charges. The Lord when accused of the offence sermonised to the king that philanthrophy, Fire, thief and the king are joint owners of public property and when the door of philanthrophy is closed thugs get hold to them a head of the king. So the king hereafter should open the channel of philanthrophy to avoid such situations. The king realised that it was none other than Lord Vaikunta Natha disguised as the thief. He prostrated before the Lord and turned a new leaf in his governance. From then on the Lord was come to be known as kallarpiran (chora natha in Sanskrit) or the Boss of the thieves. 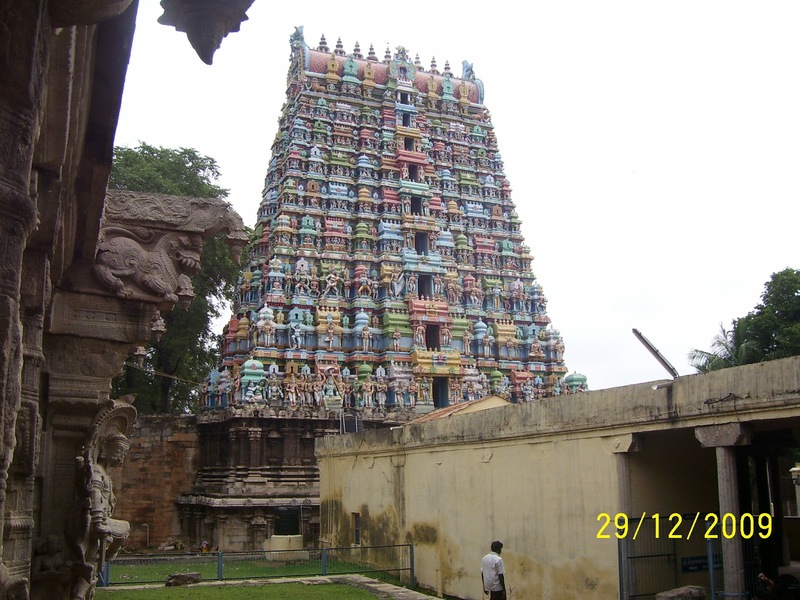 Srivaikuntam temple is also called Kailasapuram and has in Nataraja shrine, 8 artistically carved pillars. The most famous is the Kallapiran, the festival deity and presiding deity is called Vaikuntanathar. On the 6th day of Tamil month Chittirai(April), the Sun rays fall on the main deity as a token of worship. The idol is most exquisitely carved with club in hand. 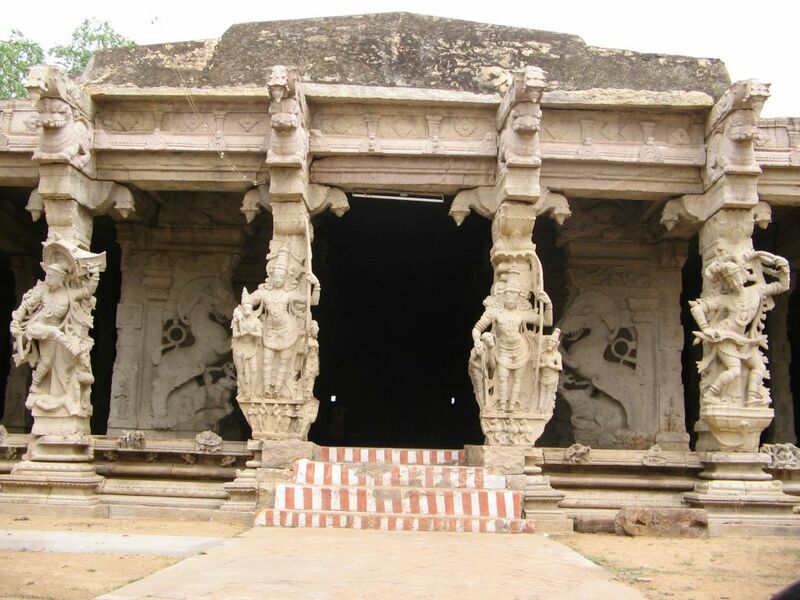 Lions, Yalis and elephants are carved in the pillars of themandapam. The temple served as a fort during the patriotic war of Kattabomman with the British. 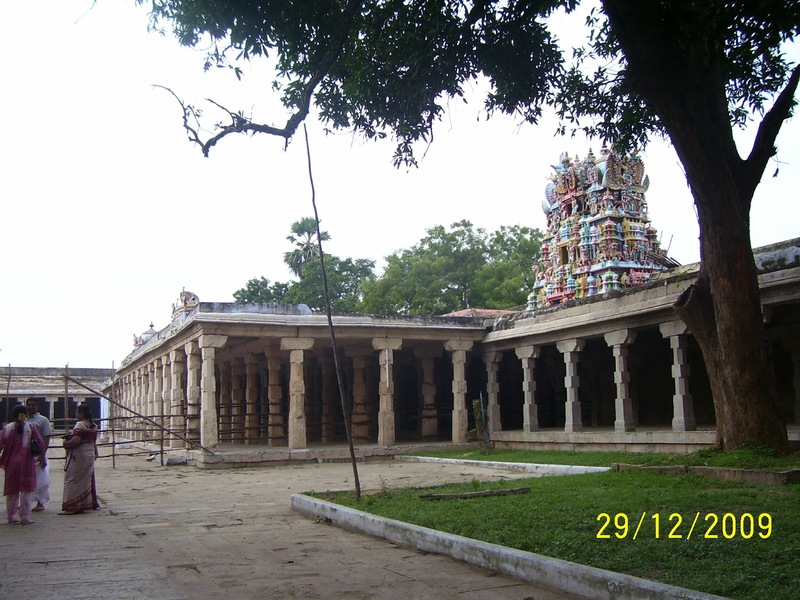 The temple has a 9-tier rajagopuram amidst lush vegetation around the temple. Festival: The Garuda Sevai utsavam(festival) in the month of Vaikasi(May-Jun) witnesses 9 Garudasevai, a spectacular event in which festival image idols from the nava tirupathis shrines in the area are brought on Garuda vahana. An idol ofNammalvar is also brought here on a Anna Vahanam(palaquin) and his paasurams(verses) dedicated to each of these 9 temples are recited. The utsavar of Nammalvaris taken in a palanquin to each of the 9 temples, through the paddy fields in the area. The paasurams(poems) dedicated to each of the 9 Divyadesams are chanted in the respective shrines. This is the most important of the festivals in this area, and it draws thousands of visitors. 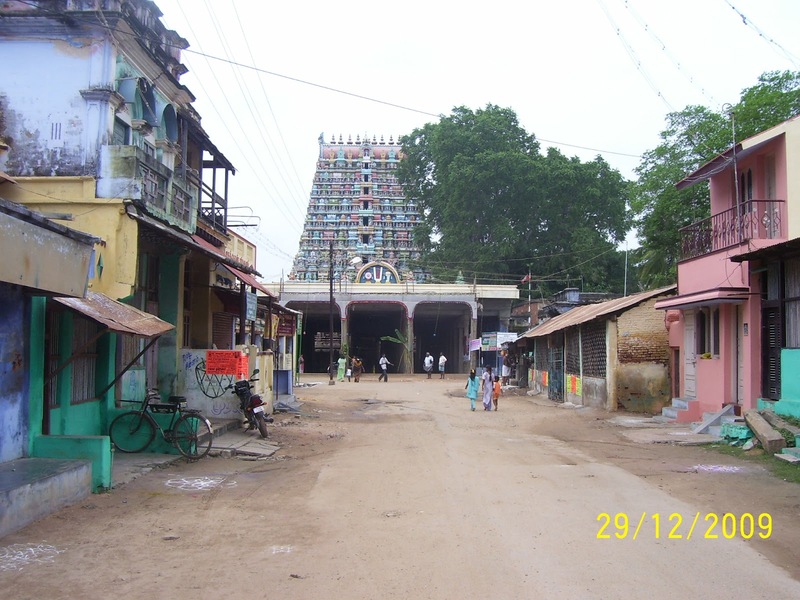 The temple is open from 07:30 a.m. to 12:00 noon and from 05:00 p.m. to 08:00 p.m.
Srivaikuntam is in the Tirunelveli-Tiruchendur railway route and the temple is about 3 kms from the station. It is about 30 kms from Tirunelveli, from where frequent bus services are available. Adequate bus-services are available from Tirunelveli / Tiruchendur.